Detectives took over the case and during their initial investigation of mall security tape they located a video from the Verizon store located in the mall. On this video detectives observed the suspect later identified as as 18 year-old Raymund Martin Daniel Boykin (DOB: 08-15-95) / Residence Unknown was in possession of the victim's purse. Boykin had entered the Verizon store after committing the robbery/sexual assault and was using the victim’s cash money to purchase a cell phone. Detectives also learned that the suspect had been in the same store prior to committing the crime and had attempted to purchase the same type phone however was lacking $20.00 to complete the purchase. Based on the information detectives obtained they were able to identify Boykin as the suspect and he was positively identified by the victim and several witnesses as the suspect who committed the robbery/sexual assault. Detectives obtained a one-million dollar arrest warrant for suspect Raymund Martin Daniel Boykin. Making this a top priority for the department we assigned a large team of detectives as well as requesting the assistance to the US Marshals Fugitive Task Force to the effort of locating and arresting the suspect. 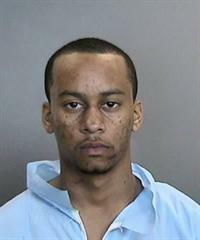 The investigation leads the detectives to the City of Anaheim. Our detectives learned at 6:30 AM today, Anaheim Police Officers were called to the intersection of Brookhurst St. and La Palma Ave. regarding a robbery similar to that which occurred in Santa Ana. At the time of their initial report, Anaheim Police Detectives were aware of a similar sexual assault in the City of Santa Ana that occurred on 12-11-2013. Both departments began to work together in an effort to establish if these similar attacks were related. Anaheim Officers discovered their victim’s vehicle had been stolen. Their Officers immediately entered the vehicle into the Stolen Vehicle System, and at approximately 1030 hours an Anaheim Police Patrol Officer located the victim’s vehicle near Romenya Dr. and Acacia St. Officers attempted to stop the vehicle and a short pursuit ensued. In the area of 500 N. Pauline St., the suspect vehicle collided with several parked cars and the driver fled the vehicle on foot. A perimeter was established for the suspect who fled and three other occupants, who remained in the vehicle, were detained without incident. A short time after the perimeter was established; a suspect was located and detained at an apartment complex in the 500 block of N. Pauline St. That suspect was identified by Santa Ana Police Detectives as the wanted suspect Raymund Martin Daniel Boykin. If you know of any additional victims or have any additional information pertaining to either of these cases, please contact Orange County Crime Stoppers at (855) TIP-OCCS,www.occrimestoppers.org , or text OCCS and your tip to 274637.